Former members of the American Volunteer Group, Flying Tigers, serving with the 23rd Fighter Group, standing beside a Curtiss P-40, Kunming, China, July 1942. Left to right: Maj. John R. Alison, Maj. David Lee "Tex" Hill, Capt. Albert J. "Ajax" Baumler, and 1st Lt. Mack A. Mitchell. National Archives and Records Administration, Washington, D.C., Record Group 342. (http://www.footnotelibrary.com/image/#28827964). 3rd Squadron Hell's Angels, Flying Tigers over China, photographed in 1942 by AVG pilot Robert T. Smith. Courtesy of the San Diego Air and Space Museum Archive. Image available on the Internet and included in accordance with Title 17 U.S.C. Section 107. Flying Tigers Personnel. Image available on the Internet and included in accordance with Title 17 U.S.C. Section 107. FLYING TIGERS. The First American Volunteer Group of the Chinese Air Force, nicknamed “The Flying Tigers,” flew combat missions in the Chinese-Burma-India theater of World War II against the invading military forces of Imperial Japan from December 20, 1941 until July 4, 1942. The Flying Tigers were composed of American pilots and technicians volunteering from the United States Army Air Corps, Navy, and Marine Corps and received financial support from the Republic of China. Claire Lee Chennault, a native of Commerce, Texas,, organized and commanded the First American Volunteer Group. The Flying Tigers volunteers earned international acclaim for their impressive combat record and contribution to the Chinese victory in the Second Sino-Japanese War. Texans serving in the Flying Tigers include Claire Lee Chennault, Charles Rankin Bond, Jr., David Lee [Tex] Hill, Paul J. Green, Mathew W. Kuykendall, Neil Martin, and Robert W. Prescott. Flying Tiger Aviation and China, Burma, India Theater Patches. Image available on the Internet and included in accordance with Title 17 U.S.C. Section 107. Chiang Kai-shek, Madam Chiange,and Claire Lee Chennault. Courtesy of the Chen Xiangmei Scholarship in Chinese Studies. Image available on the Internet and included in accordance with Title 17 U.S.C. Section 107. In May 1937, the Republic of China hired Claire Lee Chennault, a retired Captain of the U.S. Army Air Corps, pilot instructor, and author of the fighter-plane tactical manual The Role of Defensive Pursuit as a consultant for the Chinese Air Force. After fighting erupted between Chinese and Japanese troops near the Marco Polo Bridge near Peking, China, on July 7, 1937, Chennault took on a new role for the Republic of China as the de facto commander of the Chinese Air Force while retaining the official position of a consultant. Finding the existing equipment, pilots, and infrastructure of the Chinese Air Force inadequate to defeat the invading Japanese forces, Chennault returned to the United States with General Chiang Kai-shek’s approval to acquire planes, pilots, technicians, and materials in October 1940. Chennault received permission from the United States military to recruit and purchase the necessary personnel and materials, which began arriving in China in June 1941. Chennault spent the next six months training the volunteers and by December 7, 1941, the American Volunteer Group had nearly eighty pilots and sixty-two combat ready Curtiss P-40 fighters. Painting, R.T. Smith of the AVG shooting down Japanese Zero over Burma. Image available on the Internet and included in accordance with Title 17 U.S.C. Section 107. 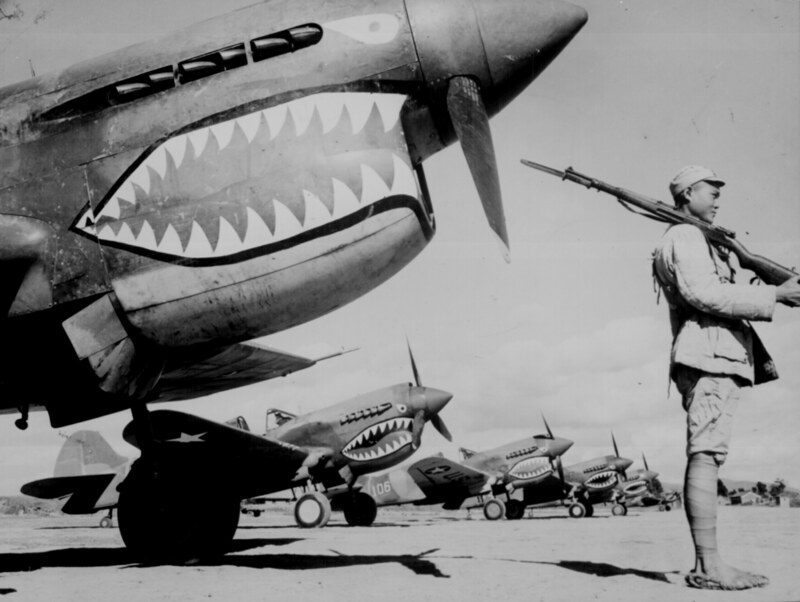 A Chinese soldier guards a line of American P-40 fighter planes. Courtesy of the National Archives and Records Administration. Image available on the Internet and included in accordance with Title 17 U.S.C. Section 107. A "Blood Chit" issued to members of the Flying Tigers. The Chinese characters read vertically from right to left: This foreign person has come to China to help in the war effort. Soldiers and civilians, one and all, should rescue, protect, and provide him medical care. Image available on the Internet and included in accordance with Title 17 U.S.C. Section 107. The Flying Tigers flew combat missions from December 20, 1941, until July 4, 1942, delaying the advance of Japanese forces throughout Southeast China and Burma. On May 7, 1942, the Flying Tigers launched a four-day assault against Japanese forces attempting to cross the Salween River Gorge. Their efforts were instrumental in preventing the Japanese from invading China from the west and India from the east. The Flying Tigers used innovative fighter tactics that emphasized the superior armament and speed of the Curtiss P-40 and improvised early warning systems, which included ground operatives radioing plane sightings to Chennault that alerted the Flying Tigers to inbound Japanese air attacks. Outnumbered in nearly every engagement, the Flying Tigers earned an extraordinary combat record of destroying an estimated 115 Japanese aircraft in combat and another estimated 300 destroyed on the ground while losing only 12 planes in combat and 61 planes on the ground. On July 4, 1942, the First American Volunteer Group was absorbed into the United States Army Air Forces as the 23rd Fighter Group. Many of the volunteers transferred back to their former assignments in different branches of the military. Claire Chennault rejoined the United States Army as a general and commanded the former Flying Tigers who joined the 23rd Fighter Group until his retirement on July 8, 1945. Claire L. Chennault Historical Markers. Courtesy of Texas A&M University-Commerce. Image available on the Internet and included in accordance with Title 17 U.S.C. Section 107. The achievements of the Flying Tigers raised the morale of Allied Forces in the Pacific Theater of World War. The Flying Tigers have been remembered and often celebrated in popular culture in films such as John Wayne’s Flying Tigers, monographs, museums and memorials both in the United States and internationally. Most recently, the Flying Tigers have been honored in Commerce, Texas, the native city of their commander, by the christening of State Highway 24 as the “Flying Tiger Memorial Highway” and by the installation of a historical marker, translating one placed in 1968, written in two forms of Mandarin at the birthplace of Claire Chennault. United States Air Force, ed. The Flying Tigers: Chennault’s Anerican Volunteer Group in China (Washington, D.C.: U.S. Government Printing Office, 2009). Charles R. Bond, Jr. and Terry Anderson, A Flying Tiger’s Diary (College Station: Texas A&M University Press, 1984). Claire Lee Chennault, Way of a Fighter: The Memoirs of Claire Lee Chennault (New York: Putnam, 1949). Duane Schultz, The Maverick War: Chennault and the Flying Tigers (New York: St. Martin’s Press, 1987). Handbook of Texas Online, Austin Baxley, "FLYING TIGERS," accessed April 22, 2019, http://www.tshaonline.org/handbook/online/articles/qtf02. Uploaded on October 8, 2015. Modified on December 14, 2016. Published by the Texas State Historical Association.